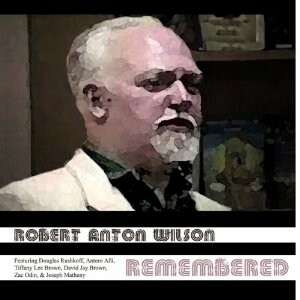 Fond remembrances of the life and work of Robert Anton Wilson, featuring Douglas Rushkoff, Antero Ali, Tiffany Lee Brown, David Jay Brown, Zac Odin, and Joseph Matheny. 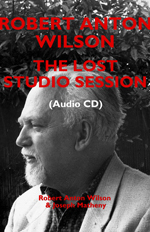 A night of ontological anarchy and poetic terrorism captured live at the Komotion International in San Francisco in February 1993. 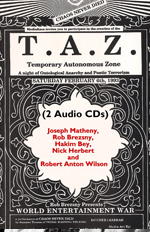 Introduced by Joseph Matheny and featuring Rob Breszny, the elusive Hakim Bey reading from his unpublished manuscripts, Nick Herbert performing his Quantum Tantric poetry, and Robert Anton Wilson rounding out the evening with his RAW witticisms. 3. Communist for the F.B.I. The song that started it all. 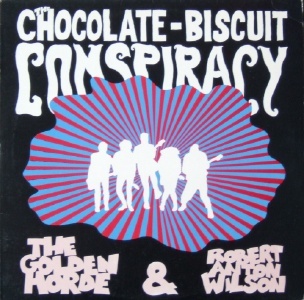 The first ever written by The Horde for Bob, on which they spontaneously create together, a maelstrom of aural conceptual and experiential (not to say conspiratorial) uniqueness. 4. Little U.F.O. At last, the truth about flying saucers! surf music lives, as Bob explains. 5. Black Flag Bob’s lyrics, written for The American Medical Associations’ final gig at Ingolstadt with The Horde attacking the listener with a virtual sonic assault!! 6. Lawrence Talbot Suite Lon Chaney Jr, The Easter Bunny, The primeval sleeve note, red curtain, the stings, a crush-can dominates a scowling buddha.